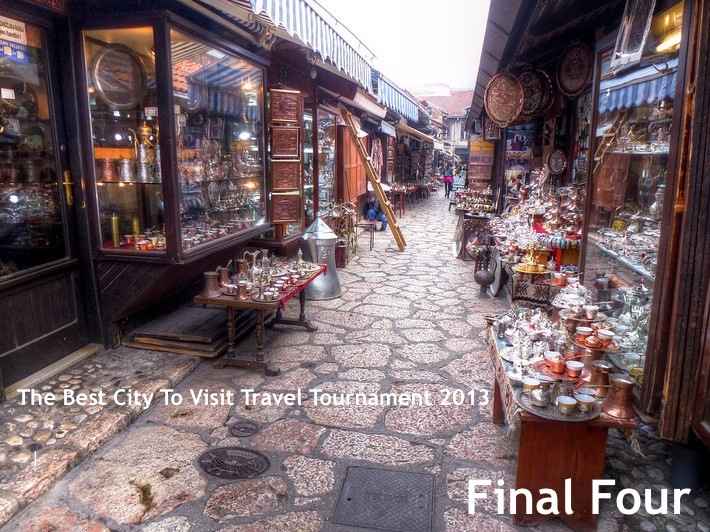 The Best City To Visit Travel Tournament 2013 that began back in mid-February with over 70 cities is now down to a Final Four: Granada, Bucharest, Buenos Aires, and Sibiu. Lisbon put up a very strong effort against Iberian neighbor Granada, but the Spaniards are left to contend with the Romanian capital, Bucharest. Also from that country, Sibiu is set to challenge surprise quarter-finalist Buenos Aires. Will we have an all, half, or none-Romanian final on Tuesday? Voting in the Final Four is open until Monday, March 25th 6pm US EST to determine the two finalists in this year’s contest. Those of you reading through email and RSS will have to click-through to this page to vote. The Best City Visit To Travel Tournament 2013 Final Four brackets. Please keep in mind the final votes for any poll aren’t final until they’re verified by my diligent verification team. The Championship round to decide The Best City to Visit in 2013 will begin next Tuesday, March 26th. Anil, a quick one: Tuesday is 26th, not 25th. So, the end of the voting for Final 4 round is Tuesday 26th or Monday 25th ? Hi Cezar, thanks for catching that. I’ll make the correction now: the end of voting is Monday the 25th. Looks like the Romanians have been working hard to win. The battle Granada v Bucharest will be tough! Soooo exciting! We will fight until the end! Granada is putting up a very strong effort, good luck! Go Granada! You can win! How fitting that my hometown, Chicago, beat out a city just a few hours’ drive from me! I’ve been to three of the top four and, vamos, hard to say which is my favorite. If you make it to Granada, please come visit Seville! I definitely will, I missed it last time I was in the area. Why can’t I vote for Sibiu? It says “This poll requires a captcha to register a vote”. Just enter the captcha and click vote, let me know if you’re still having problems. Then Buenos Aires and Granada! P.S. I could not vote for Sibiu, I had the same problem. Visit Sibiu, it’s nice, but Bucharest is not worth it IMO, it’s dull and gray. Bucharest has his plus and minuses, but in Bucharest it is the best nightlife EVER! My readers can (and do) nominate any cities they like. It’s part of the fun and adds to the variety, sorry you would prefer a more predictable tournament. It is not that I’d prefer a more serious contest, it’s that I thought it was, hence my comment. Now that I understand it is indeed a joke, I will nominate Stevenage and Paracuellos del Jarama for 2014. Not a joke, embrace the variety! Granada!! Good city to visit, the best to live there! Go to Granada, it will be amazing!! Bucharest!!!!!!!! BEESSTTT night life everrrrrrrrrrrrrr !!!!!!!!!!!!! Sorry guys, Bucharest is Amsterdam twice ! Need to go downtown! Amin to that!!!!! BUCHAREST HAS THE BEST NIGHTLIFE OUT THERE! the city is full of life anytime, not just during the weekend! Sibiu, one of the most beautiful city in Europe, probaly the best city in Romania !! Sibiu was the European Capital of Culture in 2007 !! Victor Hugo, Lorca, Shakespeare… They saw in Granada the most beautyful and inspirational wonder in the world. SIBIU-HERMANNSTADT is great ! Good city to visit ! Clearly it is better to visit Granada to Bucharest, I fall to my arabe its spell, warmth, good food, the friendliness of the people, their typical Andalusian streets. Granada es la mejor ciudad del mundo y la más bonica, además tenemos la mejor agua (como la de Lanjaron), la mejor leche (como la Puleva), los mejores bares con tapas, pubs o cualquier sitio que necesites para comer y pasarlo bien. Romania will be in the final round!! After this round, no matter the result between Granada and Bucharest, I’m sure many Spanish people will be curious about Bucharest, just as the Romanians will want to get to Granada to see its wonders. Both cities have a lot to win just by making it to this level of the tournament. Sure! Although we’re surely losing this match, it has been a great and exciting fight! Bucharest is my town and i love it ! be all wellcommed !! VENGA PAISANOS COMO VAMOS A DEJAR QUE GRANADA QUEDE ATRÁS!!! VOTEMOS QUE GRANADA SE LO MERECE, PORQUE ES LA MEJOR CIUDAD DEL MUNDO, POR CULTURA, POR ARTE, POR ACOGIDA, POR PRODUCTOS:LA MEJOR AGUA, LOS MEJORES ESPARRAGOS, LAS MEJORES TAPAS!!! I’m not from Sibiu, but I have to admit that the city is amazing, so vote for Sibiu! Sibiu is the best city to visit.Luv it!! Where’s Brasov? Brasov is way better than Bucharest or Sibiu. Nobody nominated it this year. I have visited Granada, live in Bucharest and was born in Sibiu. Would recommend all 3 but have to go for my own country 🙂 so come drink and party in Bucharest and relax in Sibiu. Sibiu City deserves to win, is a beatiful city. Zaratrustra, great attitude, respect for that. If you will come to Sibiu you will be more than welcomed, infact we can halp you with variou informations and why not, we can drink a beer in in the main square of the city or somewhere in the montains (we are very close (40 km) from the most beautifull mountains in Romania. The same invitation is valid for you, Anil, you will be more than welcomed and I’ll be glad to meet with you. I appreciate that very much and look forward to visiting Romania this year! I have noticed that this voting system does not work properly!!!! It does not detect if you have already voted, etc. I haven’t detected any errors. Well, this has come to an end and we’re definetely losing. But it has been a great match! Congratulations Bucharest! Daniel, thank you for your kind words and we are waiting for you in Bucharest as well (I’ve been twice already to Granada). It was a nice fight and I am amazed how many people supported Bucharest and Sibiu in the semifinal (from newspapers, bloggers, travel agencies, music stars), Facebook was full with vote Bucharest & Sibiu ! Que la mitad de votos a Bucarest fueron Españoles!! If the google translate is working well, I understood that other spanish people voted for Bucharest?!?!?!?! Is this a joke or we are talking about envy? I visted Sibiu in 2007 and i was amazed. The city, the culture, the people…my god it was great. Since that i wanted to vist again each year, but sadly i couldn`t. But now i`a writeing this from Sibiu. Dreams do come true. Take my advice. Visit Sibiu! It’s not in the competition because nobody nominated it this year. Visit Sibiu and you would not be sorry! Anil, though it was a good idea, you do realize this tournament became quite irrelevant? 🙂 I mean, the two cities in Romania are ok, but seriously, when is Sibiu going to be more beautiful than Paris? Or Bucharest more interesting than Rome? Never 🙂 Don’t get me wrong, I’m from Romania, I love my country, but I’m also being realistic and I also saw the little country promotion campaign you generated over here. I suppose it depends on your idea of interesting…and the votes. It is not irrelevant, and it does put Sibiu on the map. Do Paris or Rome need promotion? No…so what would be the point of them being winners here. I say, way to go! Great job!